One of the objections I hear when I present my work to people who have struggled with compulsive eating for a long time is: “Oh, I’ve struggled with this long enough. I just don’t want to deal with it.” Or: “I’m just going to get gastric bypass surgery; I don’t want to struggle with this anymore.” At this point, I feel that people have just given up on themselves and the idea that they can and will get better. All hope that they can stop eating compulsively has completely deserted them. They have gone from dieting to binge eating and back, punishing themselves with very restrictive or complex diets only to fail to stay on them and damage their bodies even more in the process. If you haven’t yet reached that stage and you’re still reading, I’m very glad you made it here in time. The truth is, you really ARE trying hard, but you are trying the wrong way. This is not how to beat binge eating. You’re doing your best. You make some progress for a while until you fall back into the “eating too much” trap; then you slap yourself with that “If I could, I would” thinking. I love motivational work. I am constantly reading books to keep me thinking positively, but when it comes to compulsions, that “You could if you just would” attitude is doing you a disservice. It keeps you struggling with the weakest weapons available: your willpower, your shame and your guilt. 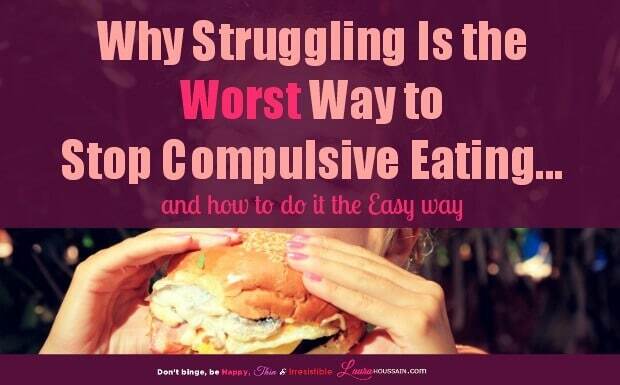 Then how can I stop compulsive eating? It’s so hard! Let me ask you this: What if you just stopped struggling? Would you just lose all will power and start binging until you end up killing yourself? Or until you get so fat you can no longer look at your feet and hate the way you look even more? Maybe. Maybe you would for a while, but something else could happen instead. Maybe without focusing so hard on what you don’t want (i.e., binging), you could start thinking about what you DO want; a healthy diet. The truth is that as long as you are struggling you are in resistance mode (tweet this). You are resisting your binge eating disorder. You are focusing on how to avoid compulsive eating, how to stop munching on chocolate bars thoughtlessly in front of the TV. You are focusing on the very things you don’t want to do, the things that often cause you to feel fear, anxiety, despair, shame, powerlessness―and anger. These emotions then feed your desire for more food and the cycle never ends. Struggling may not seem such a smart choice after all. What I have learned about wanting to break any habit, whether it’s a compulsion or something else, is that two things must occur. You must give love to yourself where it’s needed, and you must release the resistance to what you’re doing by focusing on something else over and over. Let me explain with an example. I used to smoke a pack and a half of cigarettes a day. When I stopped smoking, I resorted to a simple technique that put an end to most of my cravings in less than a week. But I could always feel the desire to buy a pack of cigarettes while walking past the drugstore. What I decided to do was this: Each time I would feel the urge to buy a pack, I would say “I’m a nonsmoker” and do my best to focus on the joy of being a nonsmoker. I used to buy my cigarettes almost always at the same drugstore. Buying a pack there had practically become a daily routine, so walking past this drugstore was a huge trigger. It took me three weeks of this little exercise to entirely remove the trigger response. I just became a nonsmoker. I didn’t achieve it by wearing a patch or with any willpower, but just by being willing to pay attention to my thoughts and feelings to bypass my automatic response to some external stimuli. It really felt effortless, and very rewarding. This was the end of my cigarette addiction; that was more than twelve years ago. I always make sure to say “I don’t smoke,” and I never use the “quit” word because quitting feels so temporary to me, whereas “I don’t smoke” feels permanent. Now think about how could this apply to create your own compulsive eating disorder treatment, by just bypassing a habitual response and being willing to pay attention to what’s happening inside of you. Does it sound like a lot of effort and struggling to you? I can assure you it was not for me―no struggle, no willpower, and so much pride and relief afterward! If, like me, you don’t think that using willpower or struggling is your way to succeed, and you would like a more gentle and caring way to stop compulsive eating, discover a simple technique I recommend to stop any craving in minutes. Just subscribe to my newsletter now to gain instant access. It’s gentle and will give you fast results without requiring you to ever need to overexert yourself. All I am asking of you is that you don’t use my techniques to starve yourself. They are not an appetite suppressant. They are designed to help you stop your compulsive eating disorder, not to turn you into some underfed, unhealthy shell of a person. 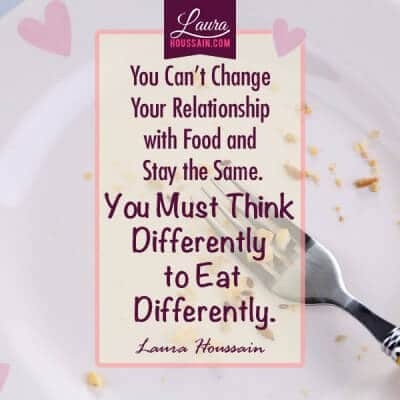 Remember to always keep your focus on what you want—your healthy eating habit—and not what you don’t want. That will be the end of your struggling days and the best eating disorder help you can find! If you want more tips on how you can stop eating too much food and start slimming down effortlessly, enter your name and email address below and click on the subscribe button. I’d love to help. Hop on the free community at join my free community here or orfire me a contact request so we can see how I can help.